In a last-ditch attempt to get the upper hand on the wild fires that are raging thru the foothills and the grasslands of the valley, the governor authorized a flight of pixies, a cattle truck full of circus dwarfs, a shaman from Alaska and nine fire eaters to be brought in. They’re housed in pup tents on the east edge of the staging area, down near the rodeo grounds. The first night in bivouac, to the alarm of the regular fire fighters, the dwarfs set about making campfires and the pixies flew thru the night waving sparklers while the shaman chanted thru a bullhorn. Then the fire eaters swallowed up the camp fires. It was a ritual in preparation for the work ahead. 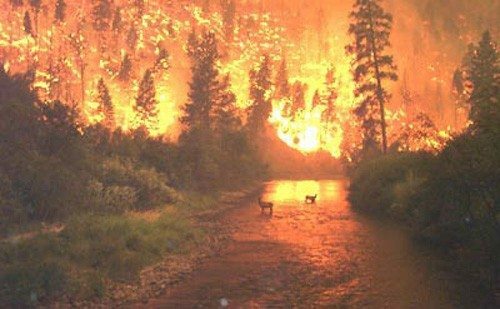 Helicopters dumping thousands of gallons of water and tons of fire retardant chemicals had proven no match for the Fire Beast, and we’ve fallen back on myth and magic.